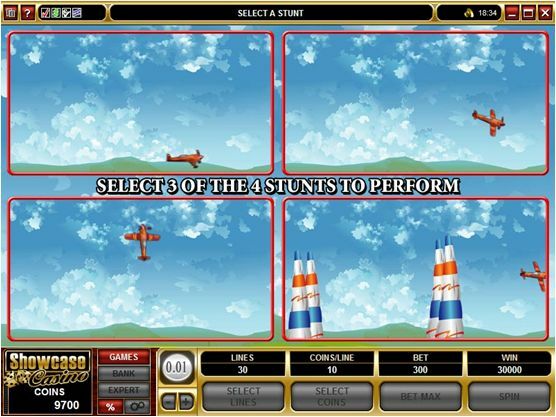 The action in Stunt Pilot revolves around a small airplane that takes part in a race. Microgaming offers us here a theme which has as a main character the pilot of a small prop plane, a racing machine which looks quite flimsy, but which is capable of great performance. I haven’t seen any other similarly themed slots so far, though airplanes have gotten their share of slot machines built around them. Quite a few bet lines are used by Stunt Pilot, 30 of them being available here. 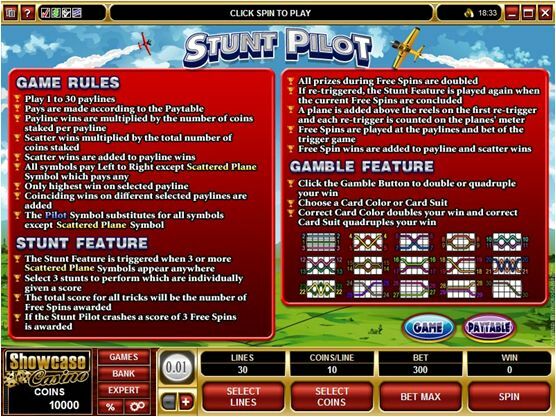 You get the Stunt bonus game as one of the more interesting features, started with the scatter’s help and giving you the free spins and a multiplier. You also have a wild in this game, which is also the symbol which awards payouts as high as $15,000. The game makes sure that you will get all the features you’re used to, including the wild and the scatter symbols. The free spins and their multiplier are obtained only by going through a bonus game, which makes the entire process a bit more fun. The Pilot is visible in only one symbol, and it is the one selected to be used as the wild. Since it’s a substitute for regular symbols, whenever it appears on one of the paylines which need an extra symbol to create a combo it will take whatever role it is required of him. It does have to land in exactly the right spot though, otherwise it can’t help out. The wild is also useful when it manages to land from left to right on the same line, with two or more of them present. It creates its own combo in that case, awarding anywhere between 5x and 6,000x the line wager. The scatter symbol is also present, and the image chosen for it is that of the Plane. Like in every other slot, the scatter symbol’s role is to give you whatever prize it has in store by appearing in enough positions, without mattering if it’s on a payline. If two to five Planes are scattered on the reels, you receive a cash prize worth between 2x and 100x what the wager was that round. 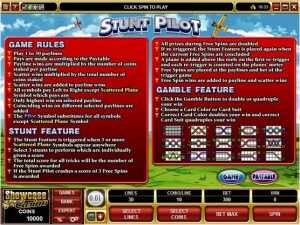 The bonus game of Stunt Pilot will be the one to determine how many free spins you can activate. You need 3+ Plane scatters on the reels in order to get into the bonus game. 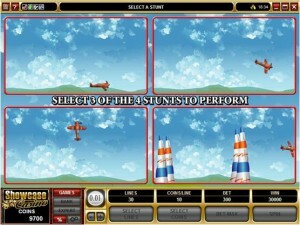 You pick three stunts which should be performed, and for each performance a score is awarded. Add the score of all the tricks, and you get the total number of spins you play for free. 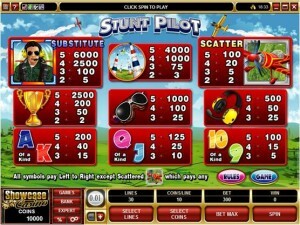 If you’re unlucky and the pilot crashes while performing a stunt, you get 3 spins for free as a consolation prize. Whatever the number of free spins you get from this feature, the wins will all benefit from 2x multipliers. 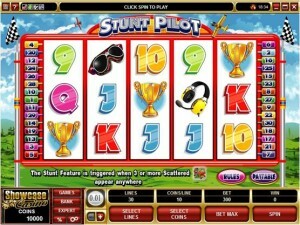 You can also retrigger the feature with the Stunt bonus game. Since there are quite a few bet lines to be used, the wagers can get relatively high, despite the small value of the maximum line bet. These line bets start at just $0.01, the smallest value of one coin, but can get up to $2.50, when 10 coins of $0.25 are selected. The total for all 30 lines can get up to $75. The game will give you a 6,000x reward if you land a five wild combo, which can mean 60,000 coins, or $15,000. Other slots will go much higher with their line bet multiple, so I’m not 100% satisfied with this prize. The playing cards give the game a very average look, since they’re used in the same form in a lot of slots, but all the other symbols and the background picture manage to save the day. You have various plane or pilot themed icons on the reels, plus a beautiful image in the background, with the racing planes in the sky and the green fields at the bottom. Symbols: Pilot (wild, 6,000x), Plane (scatter, 100x the total bet), Obstacles (4,000x), Gold Cup (2,500x), Aviator Sunglasses (1,000x), Headset (500x), Ace (200x), King (200x), Queen (125x), Jack (125x), 10 (100x) and 9 (100x). The unique theme is a good reason to play it, and the features are fun enough and following the topic. Payouts tend to be only average though, so it’s not the game that will make you rich enough to quit your job. 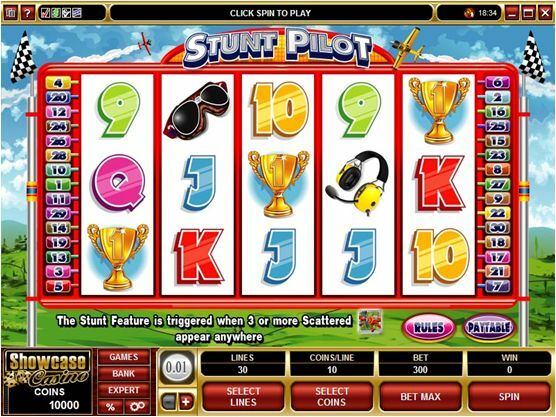 You will find Stunt Pilot at any online casino which chooses to use software from Microgaming, playable either for free or for real money.